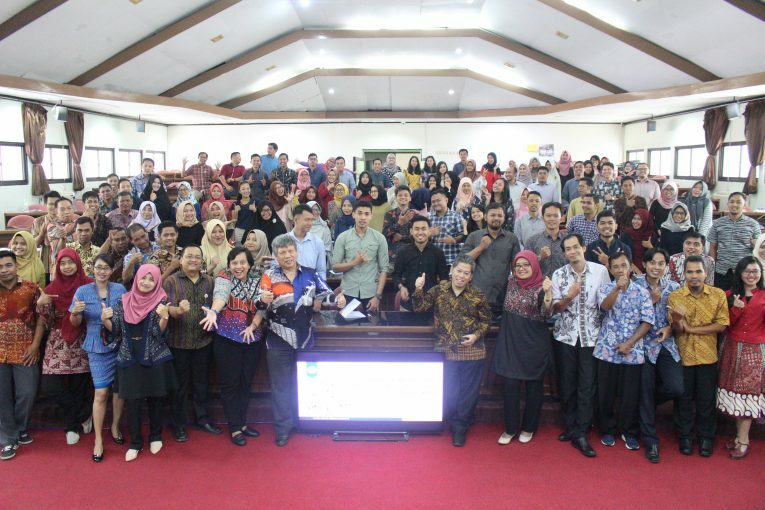 Yogyakarta – Thursday, February 7, 2019, Master of Science and Doctoral Program (MD) FEB UGM held an Academic Briefing for New Students in Even Semester 2018/2019. This event was held on the 3rd floor of the BRI Auditorium MD FEB UGM Building. The event was attended by 65 regular students of Master of Science Program, 23 matriculation students of Master of Science Program, and 8 students of Doctoral Program. The briefing was guided by Rr. Tur Nastiti., Ph.D as Manager of Academic, Student Affairs, and Cooperation of MD FEB UGM. In the first session, Program Coordinator [Director of the Accounting Study Program], Prof. Jogiyanto Hartono, Ph.D., delivered material related to the mission and vision, Learning Goals and Learning Objectives of the MD FEB UGM, and the values of FEB UGM. Prof. Jogiyanto explained that the mission and vision of MD FEB UGM had changed. The purpose of the current changes in the program (especially FEB UGM) which previously wanted to “… be the best in Indonesia”, now wants to be “… as a driver of other universities to advance at the international level.” It is the part of program vision (especially FEB UGM) as the only AACSB accredited Faculty of Economics and Business in Indonesia to contribute to other universities. The second session was continued by Nurul Indarti, Sivilokonom, Cand. Merc., Ph.D., as Director of the Management Study Program which presented Academic and Non-Academic Regulations. On this occasion, it was explained about the period of student study, curriculum, and other academic regulations ranging from lectures to finance. Furthermore, it was also conveyed about how to become a student of the MD FEB UGM Program. Nurul Indarti emphasized the importance of attitude and behaviour in studying. At the end of the material, explained about IKIGAI which is an interesting philosophy from Japan to emulate. There are several important points in it, namely 1) What you love; 2) What you are good at; 3) What you can get paid for; and What the world needs. Furthermore, Prof. Dr. Catur Sugianto as Director of Economics Program Study explained about the dynamics of campus life. Prof. Catur explains that students must prepare and understand while studying at the MD FEB UGM in particular in Yogyakarta. Also on this occasion, Prof. Catur emphasized the importance of life balance where students not only study on campus but also explore themselves in the community and surrounding environment. Prof. Catur also gives advice to students not to compete with each other unhealthy because students of the MD FEB UGM must help each other and work together in a positive sense. In the afternoon, there were two sessions presented, namely UGM material: two philosophies and five identities, and organizational socialization. The UGM material was delivered by Prof. Dr. dr. Sutaryo, S.P (Ak. ), professor of the Faculty of Medicine UGM. Prof. Sutaryo explained about UGM philosophy and identity. UGM philosophy consists of two values, namely 1) Pancasila and Indonesian Culture and 2) Science, Reality, and Truth. Meanwhile, UGM’s identity consists of five values, namely UGM as Universitas Nasional, Universitas Perjuangan, Universitas Pancasila, Universitas Kerakyatan, and Universitas Pusat Kebudayaan. Prof. Sutaryo also described the connectivity of the Congress of BPUPKI, the proclamation of the independence of the Republic of Indonesia, and the history of the UGM. This event aims to instil UGM values and love for new students. At the end of the session, Prof. Sutaryo conveyed a message to all participants that “Pursuing knowledge at Gadjah Mada [Universitas Gadjah Mada] is an obligation.” This message must be understood and absorbed by every new student as part of Universitas Gadjah Mada.